I'll admit it again, I'm a makeup hoarder. I keep everything from eyeshadows to bronzers to brushes. I found a great way to store my makeup products in a five drawer compartment and even that is overflowing at this very moment in time. Blame it on social media and my saved credit card information on Sephora's website. 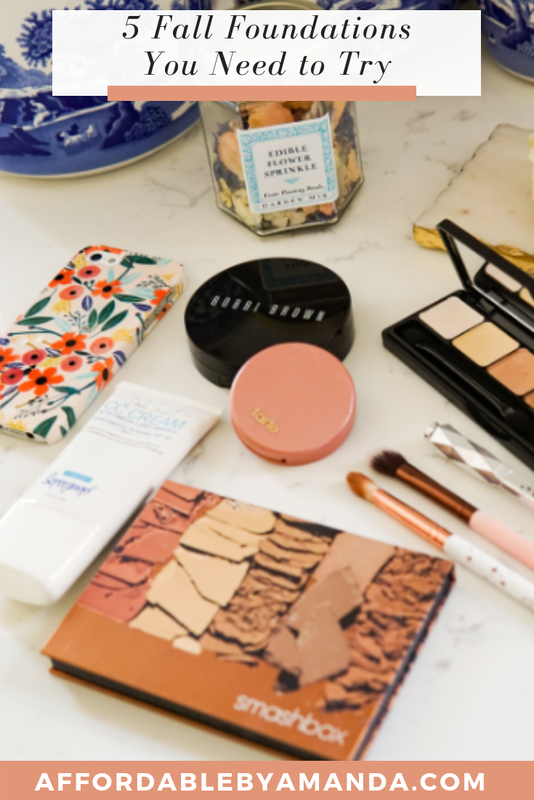 I can't help myself from trying out new makeup brands and new product releases! And don't even get me started on my obsession with CVS. I spend a few hours at a time exploring their latest releases that happen to be located in the front of the store as soon as you walk in. I've been wearing makeup since I was 12, so what can I say! I started off with bareMinerals powder foundation and now I've worked my way up into some pricey favorites, such as my bottle of Marc Jacobs. Thankfully, I have skin that doesn't need to be layered with thick coats of foundation (thank you, Accutane, dermatology visits, and four rounds of microneedling) so I don't see the need to apply liquid foundation on a daily basis anymore. However, I am still sucked into the world of liquid foundations and there are five brands, in particular, that stand out. These are the five fall foundations (as recommended by me, a makeup addict!) that you need to try! This foundation offers high coverage. I think for a $40 foundation, you can get a lot of wear out of this bottle. I chose the shade "Angel Food Cake" (lol at the name!) and it's the lightest shade available. My skin tone is pale AF so I usually find the lightest shades offered by the brand! Argan oil is found in this foundation to hydrate your skin, too. I like that this foundation is buildable and leaves your skin looking insanely flawless. I also don't need to apply a ton of product to achieve a full coverage look for the day or evening out. The texture of this foundation is also SUPER creamy! I love how it spreads evenly across my skin with just a small amount. As for a drugstore foundation, I highly suggest you go to the Covergirl section of your local CVS and pick up their newest formula, the truBLEND Matte Made foundation! This is such a fab foundation from the drugstore, guys! For the price, under $10.00, you can easily use this foundation on a daily basis for a nice medium coverage for the daytime. I love to use this foundation on its own, too. I won't need a powder on top of it because it truly provides me with a full "matte" look on my skin. The mattifying powders also ABSORB oil and minimize the size of your pores. The foundation also comes in tons of shades so you can test out the best one for your skin tone. Smashbox has an amazing line of primers and foundations. With 40 shade options, you can easily determine the best fit for you while in your local Sephora! I love this foundation because it blends seamlessly with a brush. It won't oxidize, either! The shade will look great all day long. I find myself reaching for this foundation all the time which is why it sits on my dresser while I get ready in the morning. See the difference when you try out this 24 hr long wear foundation on your skin! Too Faced line of products is always on the top of my favorites list. The Peach Perfect Comfort Matte Foundation provides the skin with medium coverage. The velvety finish is best applied with a sponge or fingertips. You can amp up the coverage to full if you slowly apply more at a time. Control your shine all day with this matte foundation to achieve a balanced look to last all day, even in a warm climate! Most matte foundations can leave you looking dry and flaky, but that is not the case with this one formulated by Too Faced. I believe it is also worth the money! My holy grail drugstore foundation is by Maybelline! I'm really glad I tried out this affordable foundation at CVS recently because I can't stop using it. The 24-hour full-coverage look looks creamy and effortless when I wear it during my photoshoots. It's oil-free and high-impact. Of course, the $10 price-point is seriously unbeatable! Maybelline is a brand I wear frequently. I use their eyebrow pencils, eyeshadow palettes, and their liquid lipsticks all the time. The lightest shade offered by this line, porcelain, is also amazing if you have incredibly pale skin like I do. I can usually wear this foundation on its own because the color stays the same all day long and will not oxidize. All I do is layer on some bronzer to make my face look more alive and less ghostly in seconds. Are you LOVING a foundation brand right now? Tell me in the comments below! I’ve been enjoying Estée Lauder foundation lately!